LONDON — Theresa May narrowly survived another bid to oust her as prime minister on Wednesday — the second attempt in five weeks — leaving Britain with a leader but without a plan as it barrels toward a March 29 deadline to leave the European Union. Lawmakers rejected the no-confidence motion in May's government, 325 to 306, just a day after her divorce proposal suffered thebiggest parliamentary defeat of any prime minister in British history. The twin votes leave the U.K. in its deepest political crisis in half a century as it grapples with how to exit the E.U. 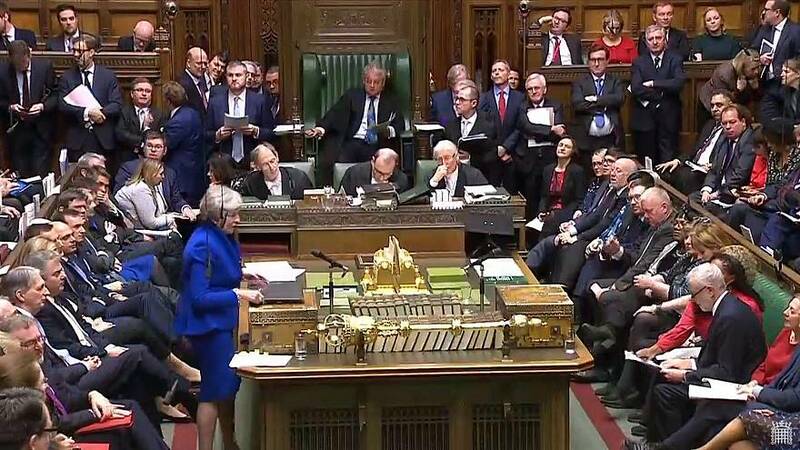 May's ruling Conservatives have 317 of the 650 seats in the House of Commons, meaning it needed the support of the Democratic Unionists, a small Northern Ireland party that has propped up her government, in the vote on Wednesday. The no-confidence vote on May's government was different from a no-confidence vote she faced on Dec. 12, when Conservative colleagues challenged her role as party leader. She also survived that vote. The latest challenge to May's authority had been put forward by the opposition leader Jeremy Corbyn, whose goal is to trigger a general election that might bring his left-wing Labour Party to power. Just before May's narrow escape, Corbyn told lawmakers she was incapable of leading the nation. "If a government cannot get its legislation through Parliament, it must go to the country for a new mandate," Corbyn said. "There can be no doubt that this is indeed a zombie government." More than one-third of Conservatives voted against her divorce proposal on Tuesday. And while that defeat was widely expected, the scale of the rout — 432-202 — was not. After her deal was rejected, May was faced with cobbling together a plan B for Brexit by next week. The prime minister has repeatedly said that the proposal Parliament rejected was the only one on the table. The E.U. has also insisted it is not willing to renegotiate. 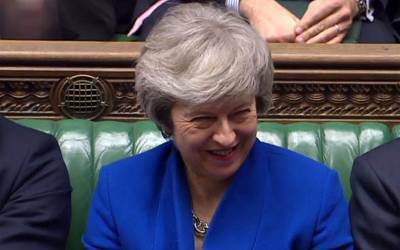 During a question-and-answer session in Parliament before Wednesday's vote, May said she wanted to listen to lawmakers to find out what type of deal would get enough support to pass. "We are living through an historic moment in our nation's history following the referendum that divided our nation in half," May added. "We dearly need to bring our country back together." If Parliament can't agree on a divorce plan, the U.K. will face a "no-deal" scenario that would see Britain crash out of the 28-member bloc without a trade agreement, something most experts say would have a catastrophic consequences. Shortages of food and medicine, civil unrest, chaos at ports and airports have all been forecast as possibilities under a "no-deal" Brexit. There are also concerns for what Brexit means for the border between Northern Ireland, which is part of the U.K., and the Irish Republic, which is a separate country and will remain part of the E.U. With no clear majority in Parliament for any single alternative on Brexit, there's a growing chance that Britain may seek to postpone its departure date while politicians work on a new plan — or even hand the decision back to voters in a new referendum on Britain's E.U. membership. Pro-E.U. lawmaker Dominic Grieve introduced a bill Wednesday that aims to lay the groundwork for a second referendum, which he called "the only way out of the current crisis." Leading Brexit campaigner Nigel Farage told broadcaster Sky News Wednesday that he thought Britain would most likely be forced to delay the scheduled date for Brexit and that another referendum on the issue might be necessary to break the gridlock in Parliament. "I think and I fear that we are headed on a path towards delay and probably, yes, a second vote," said Farage, who is a former leader of the pro-Brexit U.K. Independence Party. European leaders appeared to be preparing for the worst. German Chancellor Angela Merkel said Wednesday that, while she could not envision a renegotiation of the divorce deal, she would not rule out further clarifying Britain's future ties with the bloc. French President Emmanuel Macron was more blunt, telling Britons to "figure it out yourselves."